If your are in need of a Lithuanian passport photo or visa photo, then Reload Internet is the best studio to come to. 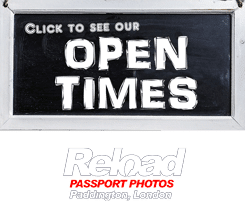 We are located in Paddington, London, and have been in operation for well over a decade, taking hundreds of passport and visa photographs every single week. You don’t need an appointment to have your Lithuanian passport photo or visa photo produced by us, just stop by our store and a member of our experienced team will be happy to help you! We will provide you with a set of 4 high-quality Lithuanian passport photos or visa photos, that meet all of the requirements and come with a guarantee to be accepted at the Embassy along with your application. We will capture your photo with the correct background and lighting, then cross-check it with the official Lithuanian passport and visa photo guidelines to ensure that it will pass. After we have confirmed this, we will print your photos using the latest digital photo printers and cut them to the correct size. 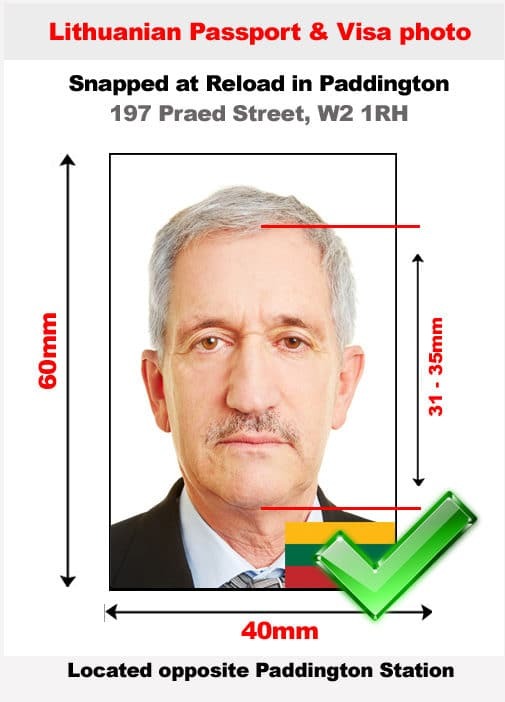 Your Lithuanian passport photo or visa photo must meet all of the criteria listed below, otherwise your application will likely be rejected at the Embassy because of a photo error. The dimensions of the photo should be 40 mm X 60 mm. The photo should be clicked in a manner such that it can be cut into 35 mm X 45 mm. From the top of the photo to the top of the head, the distance should be 2 mm to 4 mm. From the chin to the top of your head, the distance should be in the range of 31 mm to 35 mm. From the chin to the bottom of the photo, the distance should be in the range of 8 mm to 10 mm. Your face should be equidistant from all the corners and the head should be upright, such that when you draw a line along your eyes, it should be in parallel to the edges of the photo. Your face should be entirely visible along with the top of your shoulders. Maintain a neutral expression and close your mouth without smiling or frowning when you click the photo. If you are using a head cover due to religious reasons, make sure that your cheeks, eyebrows, eyes and chin are clearly visible. If there is a head cover used in the photo, a letter from the religious body’s head must be presented. If you wear glasses, click the photo with the glasses on. Ensure that there is no reflection or flash resulting from the glasses. In case the applicant is an infant and the photo cannot be clicked easily, you can have a proportionally smaller picture of the baby, while the distance from the top of the head to the chin should not be more than 25 mm. If the natural posture or features do not support the requirements, an exception can be made. No other people or things apart from the applicant should be visible in the photo. In case of children below one year, you can hold their hand or support them for the photo. However, the background must remain bright. The background color should be in contrast to the face, hair and clothes that are worn by the person, such that the photo is clear even when converted to grayscale. For applicants with bright hair, ensure that the background is darker by at least 18% when compared to the hair, so that the photo is visible clearly without any blur or distortion. Should your Lithuanian passport photo or visa photo fail to meet all of the requirements listed above, then it is likely that your application will be rejected due to a photograph error when you go to submit it to the Embassy of Lithuania. Reload Internet can help you avoid this, when you have your Lithuanian passport photo or visa photo produced by us it comes with a guarantee to be accepted the first time you submit it to the Embassy of Lithuania. Our specifications are taken from the Embassy of Lithuania’s guidelines on passport and visa photographs, which you can see here.